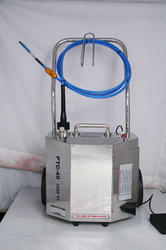 Offering you a complete choice of products which include electric tube cleaner. Suitable For Tube OD 1/4"-1 1/2"
Operates on single phase supply which is easily available. Water flows through the Shaft. It soft the scale & flushes out from the tube. Tube cleaner operates by foot.flexible shaft is easily connected and disconnected mobile trolley for easy movement. Looking for Electric Tube Cleaners ?